AgroAtlas - Crops - Citrullus lanatus (Thunb.) Mansf. - Water-melon. Citrullus lanatus (Thunb.) Mansf. - Water-melon. Family Cucurbitaceae Juss., genus Citrullus Schrad. Citrullus vulgaris Schrad., Cucurbita citrullus L.
Annual plant. The root strongly ramified, goes deep into soil on 1 m and more. Stalk creeping liane, much-branched, 5-faced, up to 5 m length, pubescence with rigid hairs. Leaves hispid, deeply lobed on 3 pinnately cleft shares, gray-green, with leafstalks. The size of a leave blade from 10 up to 20 cm. Auxiliary tendrils 2-separated, flat, are adapted to cling to lumps of soil. Alternate leaves are ranged on the every 5-7 cm of a stalk. Monoecious or dioecious plant. Flowers grey-yellow, auxiliary, single, less often - in bunches. Pistillate flowers are larger then staminate one's. Staminate flower has 5 stamens (4 stamens have grown together by pairs, 1 stamen is free). Pistillate flowers with downiness ovary and pentagonal stigma. Pollinated by insects. Fruit - polyspermous berry - melon. Fruits are spherical, cylindrical, oval, weight 6-12 (till 20-25) kg. Colouring of fruits motley (figure as a grid, strips, spots), but sometimes may be monotonously white, green or nearly so black. Pulp of placentae is red, pink, juicy and sweet. Seeds flat, ovate, white, yellow, red, brown, black and marble, the size of seeds from 0,5 up to 1,8 cm length and from 0,3 up to 1,1 cm width. Weight of 1000 seeds 60-150 g. Seeds keep germinating capacity till 8-10 years. The centre of origin of a water-melon is the desert Namib and semidesert Kalahari in Southern Africa. It was delivered in Russia from Middle Asia in 15 century. In the former USSR countries table forms of species are cultivated on 600 hectares in the Lower and Middle Volga regions, Central Chernozem area, on the Far East (early-ripenning grades), on Northern Caucasus, Ukraine, Moldova, republics of Central Asia. Thermophilic, but the heat resisting plant, does not tolerate shading. Plant of short light day. 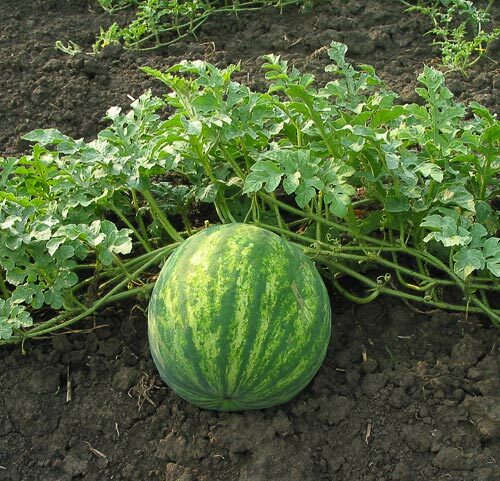 The water-melon gives high crops on light fertile brown, and chernozem soil. Grows better on virgin, laylands. Does not suffer frosts. Seeds sprout at temperature 15-17° C. Optimum temperature of growth 30-45° C. Draught-resistant. Necessary sum of active temperature 2000-3000° C. Period from shoots till fructification takes 60-140 days depends on a grade. Grades: Ogonek, L'ubimets hutora P'atigorska, Donskoj 39, Roza yugo-vostoka, Bykovskij 199, Desertnyi 83, Melitopol'skij 60. Fruits of a water-melon are rich sugar 5.5-10.6 (up to 15) % of dry matter. The most part of it is compounded with fructose, and also there are glucose, saccharose. Fruits contain vitamins A, B, C, folic acid, iron. A water-melon valuable raw material for the food-processing industry. Useed as a fresh product, for preparation of candied fruits, pickles, water-melon honey (nardek - in Central Asia). Oil extracte from seeds (25-30 %) is used for treatment of rickets. Medicinal value of water-melon fruits - treatment of illnesses of kidneys and the prevention of stone's formation there. Average productivity 25-30 ton per hectare. Belik V.F. Melon growing cultures. Moscow, 1975. 270 p.
Erenburg P.M., Gutsaljuk T.G. Water-melons and melons. Alma-Ata, 1976. Makarovskij A.F. Melon growing cultures in the south and a southeast of the USSR. Moscow, 1958. Mamonov E.V. The sort's catalogue. Vegetable cultures. Moscow, 2001, 496 p.
The directory on vegetable growing and melon growing. Donetsk, Donbass. 1971. 367 p.
The world of cultural plants. The directory. Ed. by V.D. Baranov, G.V.Ustimenko. Moscow, 1994,381 p.
Vehov V.N. Cultural plants of the USSR. Ed. by T.A.Rabotnov. Moscow, 1978, 336 p.
Zhukovskij P.M. Cultural plants and their relatives Leningrad, 1971. 752 p.